A cash sale is a quick way to sell merchandise items, such as boxes, locks, rope, bubble-wrap, etc to walk-in Customers. Generally, you would use cash sales for Customers that don't store with you and their design reflects this with a streamlined approach that allows you to add the items for sale and receipt payment, finalising the process with a printed invoice or receipt. During this process you will be constructing your sale and taking payment. Add New Transaction. 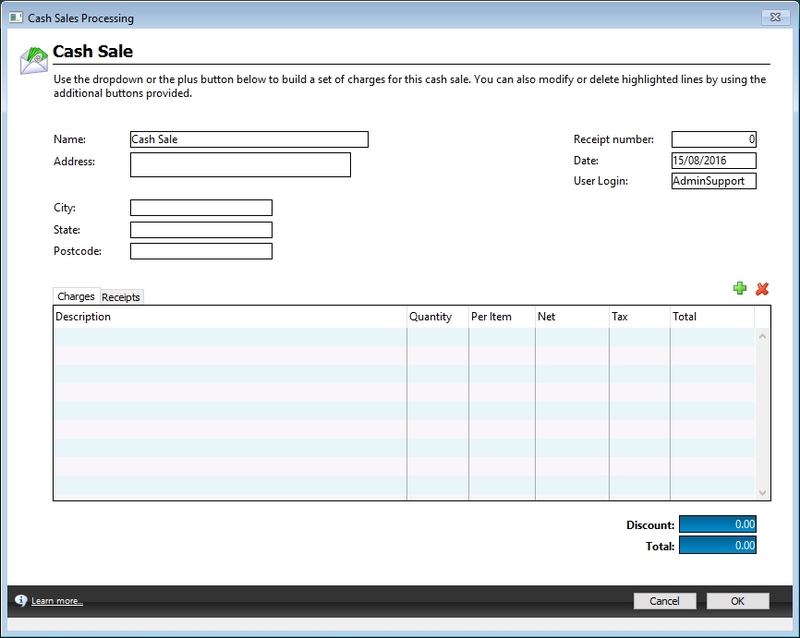 This will add a new transaction for today's billing and start the sale building process. Button Add Single Receipt Sale. This is used for sales with 1 type of payment. Button Add Multiple Receipt Sale. This is used for sales with more than 1 payment. Select the Green plus button to add charges to the sale. Once taken a payment go to the Receipts tab and select the green plus button again. Add Charge. This is to add one item of purchase. Add Receipt. This is to add a payment by the customer. When complete, click OK to complete the transaction and Done to return to your dashboard.